Meet Sandeep Bacche, whose rickshaw boasts free Wi-Fi, a payphone, weather and stock market updates, and a whole lot of generosity. 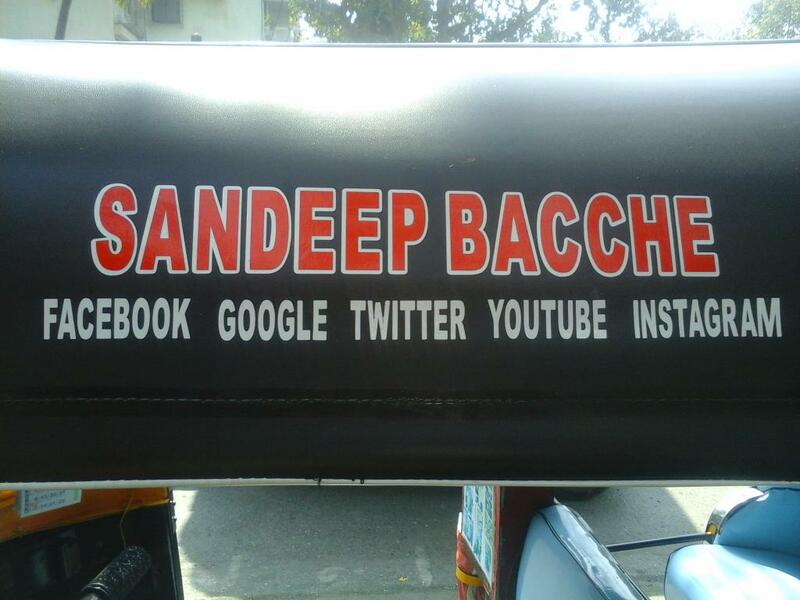 This is Sandeep Bacche. He has been an auto rickshaw driver in Mumbai for over 15 years. Sandeep is 37 years old, and was born and raised in the Bandra-Khar area of Mumbai. He lives in a 10-foot-by-10-foot room with his wife, father, and two children. If you find yourself aboard his rickshaw – as I did one Tuesday morning – you're likely a jaded Mumbai-dweller without the time or inclination to look around and notice its wonders. But even in my pre-caffeine stupor, I couldn't help but giggle out loud at the STD/PCO payphone mounted next to his meter. 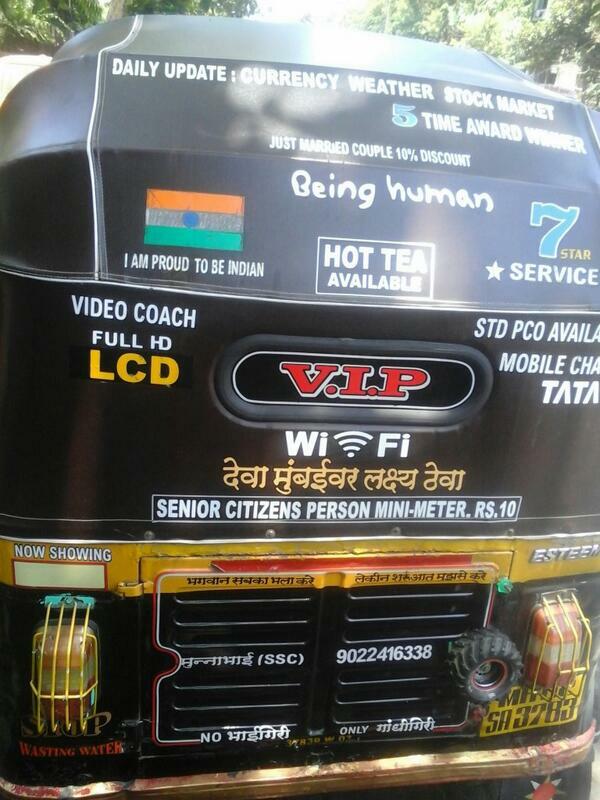 Noticing my amusement, Bacche informed me that his rickshaw also has Wi-Fi and a TV screen. By this point, my curiosity had been sparked. Knowing that I only had a five-minute ride (sue me, I'm lazy), I asked Bacche to pull over so I could observe the magic in full. He turned out to be unbelievably friendly and was happy to give me a tour. So, here goes. Every morning, Bacche puts the day's papers in his rickshaw, and writes announcements of the day's weather forecast and economy updates on a board above the windshield. He also writes birthday wishes to any celebrities whose birthdays happen to be on that day. However, he told me he doesn't do this for politicians. When I asked why, he said he hates politicians. "When my mother was dying of cancer, I went to a lot of people for help, including some MLAs, and they didn’t give me any time," he told me in Hindi. "I went to their offices many times then I got tired of it." His rickshaw has a first aid kit as well as some spiritual first aid. He changes the medicines and cotton in his first aid kit once every three months (even though they expire much later) so as to ensure their hygiene. And his rickshaw provides some sage advice we could all do well to heed. He also stocks the rickshaw daily with two water bottles (one for him, one for his customers), hot chai to be served to customers all day, and candy to give to children. Mainstays of his vehicle include a tissue box and perfume. But most importantly, Bacche's rickshaw reveals his extremely philanthropic nature. In the back is a donation box where you can pick up free candy in return for donations. All collections go to cancer relief. In the background, please note photographs of Bacche with celebrities including Rajdeep Sardesai, Salman Khan, and Cyrus Sahukar. He gives discounts on rides to the elderly, the handicapped, and the newlywed. And he donates a portion of every fare he receives to charity. Bacche told me he makes between ₹800 and ₹1,000 per day, of which he sets aside upwards of ₹50 to donate or to buy food for the poor. Every couple of weeks, Bacche rounds up hijdas (eunuchs) at traffic signals and takes groups of them for chai. "People stare and take pictures of us," he said, "but I'm not bothered. We're all humans. The government doesn't provide them with enough jobs and facilities, so I can spare a little money for chai." He told me that this is why hijdas at most of Mumbai's traffic lights recognise him, and don't demand money from his passengers. I asked Bacche how and why he began devoting so much of his time and income to charity, and he told me his moving story: He worked at a travel agency until it shut down in 1999. He then began driving a rickshaw to keep himself and his family afloat. He managed well and easily for five years until his father retired, making Bacche the sole breadwinner in a household also inhabited by his parents, his wife, and his two children – a son and a daughter. That same year, his mother developed a persistent cough that wouldn't go away. Bacche saved enough money to take her to a doctor, only to be told she was suffering from stage 3 throat cancer and couldn't be saved. "Take her home and keep her happy," the doctor told him. A month later, she died. "Many people told me they would help out – politicians and common people – but nobody donated anything or helped me at all," he told me. "Then I started asking myself questions. I've always been a follower of every religion – I go to churches and temples and mosques and gurudwaras – but how can I believe in god? That's when I started thinking: There is no god. If there is, why didn't he or she help me? What was lacking in me? Why did this happen to me?" Bacche then went to a guru in Pune for guidance. The guru told him that if he does good work in his life, his mother would find peace. "I ignored him," Bacche said. "A dead person is dead, they can't be peaceful." He remained depressed and disillusioned for months. "Then one day, I was driving my rickshaw and I crossed some construction work," he told me. "I saw a poor Rajasthani woman with her young son. Both were crying. Everyone could see them but nobody asked why she was sad or offered to help. In Bombay nobody has time for anybody else." Moved by her grief, Bacche pulled over and asked the woman why she was crying. She explained that she, her husband, and their baby live on a footpath and beg for money, but that her husband squanders all their collections on alcohol. "I gave her three rupees and her face lit up. While I waited at the signal, I saw her buy a Parle biscuit and give it to her son. Her son held it with both his hands and devoured it. She looked as happy as if I'd given her a hundred rupees." "That's when I realised I have nothing to complain about. There are people who struggle every day of their lives and they get so much joy from three rupees and a biscuit, so who am I to cry about my life? I have a roof over my head, I have a family, I have an income. Why not help such people? People whose lives have gone dark, why not bring some light into them?" Bacche's charity work began then, and he started small – for three years, he handed out candy and food to beggars at signals and on sidewalks. Gradually, the scale of his charity grew, and now – 11 years later – he's developed a bit of a reputation. "All sorts of people call me saying, 'Munnabhai, please help.' People getting some sort of medical treatment, people who have been injured, people who have come into bad luck. I help them all as much as I can." Bacche's charity work has gotten him lots of attention. He's been profiled in newspapers 28 times and on TV 15 times, he told me. He has been the recipient of several social work awards, and was even invited to give a TED talk. Several celebrities have gotten wind of his philanthropy and given him in-person congratulations, including Anurag Kashyap, Shahid Kapoor, Ranvir Shorey, and even one of his personal heroes, Salman Khan. Of all his publicity, Bacche told me he likes doing radio interviews most. "When I do interviews on the radio, they give me a goody bag. I gift candy from inside it to my children and I take that bag to my village." During our two-hour conversation, pulled over in a side-lane in Bandra, two people recognised Bacche from the press. He thanked them for their support and offered them hot chai. 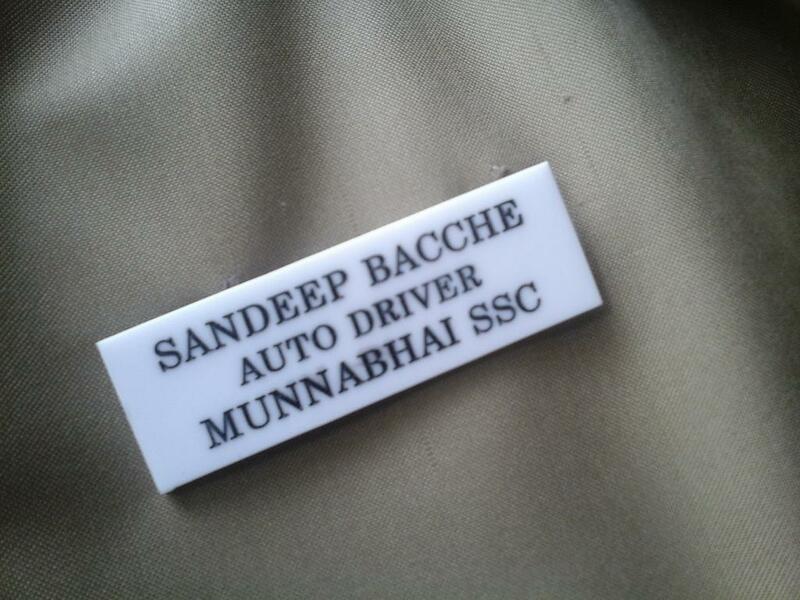 He also told me he's a massive Sanjay Dutt fan, and has therefore nicknamed himself Munnabhai SSC. Yup, that's him getting Sanjay Dutt's face tattooed on his bicep. He also has "Munnabhai" tattooed on one of his forearms. Bacche's birthday is on the 31 December, a day on which he provides free rides all day, year after year. At night, he told me, he goes to Juhu beach and watches the fireworks, imagining they're for him. "When I help someone and they thank me, I tell them, 'Don't thank me. As thanks to me, just go help someone who needs it,'" Bacche said. "I've met a lot of people who have crores of rupees, but their hearts are very small and they live only for themselves. I don't have much but I'm proud to share what I have. I'm proud to be Indian. 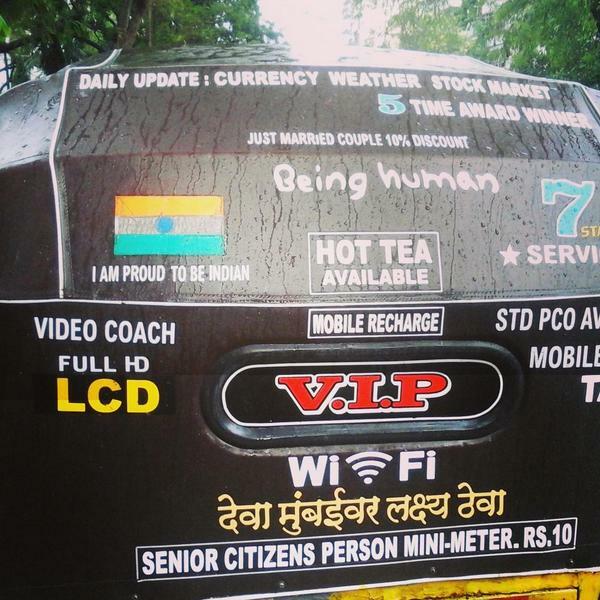 I'm proud to be an auto driver. I'm proud to have the opportunity to help other people." I asked Bacche about his future plans, and, without missing a beat, he painted a specific picture. "I want my own house, with a letterbox and a nameplate outside," he said. "And I want to make sure my son and daughter are educated. That's my dream." After we had talked for an hour and a half, I paid Sandeep the fare I owed him and a little extra for his charity work. He gave me his phone number and said, "Kuch bhi chahiye hoga, kabhi bhi, toh bas Munnabhai ko phone kar lein." I think it's safe to say we've found the most interesting man in India. And, hey, he's happy to give you a ride.